They look so sweet! 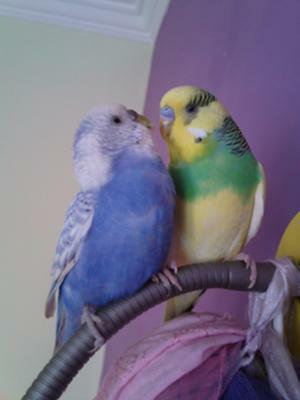 I am getting budgies soon and I decided a blue-and-white, and a green-and-yellow. Kind of like your own! Two lovely budgies, we have just collected two budgies from a rescue centre in wales uk. Our Tweety died last week he was an unwanted bird and we think he must have been about 13 years old as we had him since 2001 and he wasn't a young bird then. I just love budgies and have budgie ornaments etc. they are such cheerful little fellows.